Born in Orleans, France, the son of a wealthy merchant, Isaac Joques was sent to a Jesuit school when he was ten years old. While at first wary of the strict rules of his new school, by the time Isaac graduated, he was determined to become a Jesuit priest and a missionary. Soon after Isaac entered the Jesuit seminary, a group of priests, including Fr. Jean de Brébeuf, visited while enroute to New France (Canada today) as missionaries. The visit rekindled the desire to be a missionary in Isaac and he begged to be allowed to go to a missionary country upon ordination. Isaac was ordained in 1636 and, at his wish, sent to New France. Soon after, he was assigned to work with the Huron Indian tribe in an area of New France near what is now Sault Ste. Marie, Ontario. The journey from Montreal, the capitol of New France, to Huron country was always perilous. Iroquois war parties often made raids along the route, killing or capturing many of the Hurons. Since the Hurons regularly made supply runs to Three Rivers and Montreal accompanied by one or more of the Jesuits, this was a recurring danger. In the summer of 1642, a year in which the Iroquois had been making many brutal raids, the Hurons planned an expedition to Three Rivers in order to bring in supplies for the coming winter. Fr. Isaac volunteered to accompany them, which would allow him to report the mission progress to his Jesuit superiors in Montreal. On August 3rd, while returning to Ste. Marie, a large Iroquois war party ambushed the expedition and killed or captured the entire group. Literally dragged through several Iroquois villages, Fr. Isaac, René Goupil, a French layman who volunteered to help the Jesuit missionaries, and the surviving Hurons were forced to run a gauntlet between Iroquois men, women and children, and were savagely beaten at each of their stops. Isaac had his fingernails pulled out and his thumb bitten off during this march. A council of Iroquois chieftains decided to split the surviving prisoners among the villages, some to be killed and others to be enslaved. Fr. Isaac and René were sent to the village of Ossernenon (a settlement about forty miles north of present day Albany, NY) to become slaves to the village chief. Ossernenon was inhabited by several clans of the Iroquois nation. One of them, the Bear clan, was especially hostile to the French. After recovering from their wounds as much as was possible, Isaac and René spent much of their time helping the women collect the corn. They also said the rosary frequently. Fr. Isaac, having spent many years among the Indians, chose to evangelize by example, rather than preaching. René, new to missionary work, and despite repeated advice from the priest, took a more direct approach. Observed teaching a young child how to make the sign of the cross by a warrior of the Bear clan, René was marked for death, but not before receiving absolution for his sins from Fr. Isaac. René then became the first of the North American Martyrs. Isaac had been adopted by one of the older Iroquois women who became his “Aunt.” To the extent that she was able, she shielded him from the viciousness of the warriors. In the spring of 1643, “Aunt” and her family took Isaac along to the fishing grounds several miles away from Ossernenon. Realizing the danger that he was in, Aunt encouraged Isaac to escape, telling him that the Dutch settlement was just hours away, but he felt the call to mission too strongly to leave. Upon returning to their village, Isaac learned that one of the chiefs, who believed that his son had been killed in a skirmish with another tribe, wished to kill Isaac as a sacrifice for his son. On the morning when this was to take place, a brave from the raiding party came back to the village with the news that the chief’s son was alive and was returning with several captives. For the moment, Isaac was forgotten. “Aunt”, however, pleaded with Isaac to escape, telling him that many of the braves in the Bear clan were looking for any excuse to kill him. Recognizing that he could do no more evangelizing among the Iroquois, Isaac began to think seriously about escaping. Sometime later, “Aunt” again took Isaac along on a fishing expedition. This time, she told him, they would stop first at a Dutch settlement to trade furs. She urged him to use this opportunity to escape. As they had on an earlier visit, the Dutch offered a large ransom to the Iroquois for Isaac’s release, but this was refused by the Iroquois. Sensing that Isaac had a role in the defeat of an Iroquois war party in an attack on the French settlement in Montreal, the Iroquois beat him mercilessly. They intended to take him back to Ossernenon where he would be tortured and killed. The leader of the Dutch settlement felt that he would assume responsibility for Isaac’s death if he did not help Isaac to escape. After some unsuccessful attempts, he arranged to sneak Isaac aboard a small Dutch ship that was visiting the settlement. From New Amsterdam (now New York), Isaac sailed home to Europe. Arriving on French soil on Christmas morning in 1643, the first thing Isaac wished to do was to confess his sins and attend Mass. The villagers, learning that he was a missionary priest from New France, spread the word throughout the region. A merchant offered to take the priest to the Jesuit College of Rennes. There, Fr. Joques presented himself to the rector who, upon learning Isaac’s identity, celebrated a Mass in thanksgiving for his return. While pleased to again see and visit with his friends, and be with his mother who had thought that he was dead, Isaac was uncomfortable with the acclaim, which came from all quarters—even the queen of France. He longed to return to New France and the Indian Missions. In the spring of 1644, his superior granted permission. One detail remained. Fr. Isaac had not celebrated Mass for 20 months. His hands had been so deformed by the torture that he was incapable of holding the Host in a normal fashion. Informed of this and the sufferings that Isaac had undergone, Pope Urban VIII immediately granted permission for Fr. Isaac to celebrate Mass. Arriving in Montreal, Isaac learned that several of the Iroquois nations were again at war. Isaac begged his superior to allow him to return to the Iroquois, noting that he understood their language and customs. The opportunity came when a peace council that Isaac attended with French officials met with the Iroquois and reached an accord. Soon after, word came that “Aunt” wished Isaac to return to Ossernenon. Isaac was appointed ambassador to the Iroquois. After stopping in several Iroquois villages and speaking with the chieftains, Fr. Isaac proceeded to Ossernenon where he was treated well by all, including those who had tortured him a few years earlier. Isaac had brought with him a box containing the articles needed to celebrate Mass. Some braves, suspicious of the box and what it might contain, questioned the priest. Isaac opened the box and showed them and asked them to hold the box until his return to which they agreed. A few months later, Isaac was asked by his superior if he would be willing to accompany a group of Huron Indians who wished to spend the winter with the Iroquois to demonstrate their commitment to the peace accord. Fr. Isaac readily agreed. As the group approached the Iroquois region, many of the Hurons became suspicious and withdrew. Isaac and a few others continued on. When they neared Ossernenon, a group of Iroquois in war paint attacked and beat them and dragged them into the village. They were thrown into a longhouse where “Aunt” dressed their wounds and explained to Isaac that, while the other clans desired peace, the Bear clan did not. While he was gone, a sickness had afflicted the tribe, killing many people. A drought had later destroyed most of their crops. The tribal medicine men convinced the warriors of the Bear clan that an evil spirit escaped from the box that Isaac had left behind and caused all of their woes. While the chiefs were away at an Iroquois council called to determine the fate of Isaac and the Hurons, the Bear clan invited Isaac to a meal in their longhouse. “Aunt” was suspicious, but agreed that he must accept. When Isaac entered the Bear clan longhouse, he was killed by a blow to his skull from a Bear clansman wielding a tomahawk. Only after his death did the word return from the council that Isaac and the Hurons were to be spared. 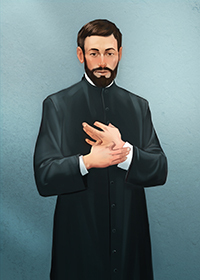 This saint is honored, along with St. Jean de Brébeuf, René Goupil, and all of the other North American Martyrs, by a memorial on October 19. Isaac's message today: Isaac Joques strongly felt God’s calling and, even knowing that he would suffer martyrdom if he returned to the Iroquois, he willingly did so. Few of us are called to martyrdom today, though many will suffer some degree of persecution. Can you love your neighbor, as Jesus asked us to do, even knowing that your neighbor harbors ill will against you?